Welcome to the Verify CCO Online (VCO) System of the National Commission for the Certification of Crane Operators (NCCCO). This database is a comprehensive directory of individuals who have been accredited and authorized by NCCCO to administer practical examinations for CCO certification programs. 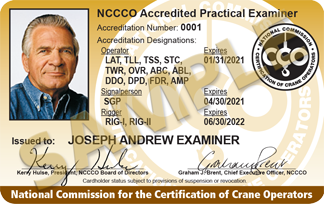 The National Commission for the Certification of Crane Operators (NCCCO) issues CCO cards for Practical Examiners. These cards have a brown band across the bottom.